Productive, early maturing variety bears large, dense heads—up to 12 inches across—that are tops for making into slaws and sauerkraut. The cabbage heads, weighing up to 10 lbs., have a white to light green interior. 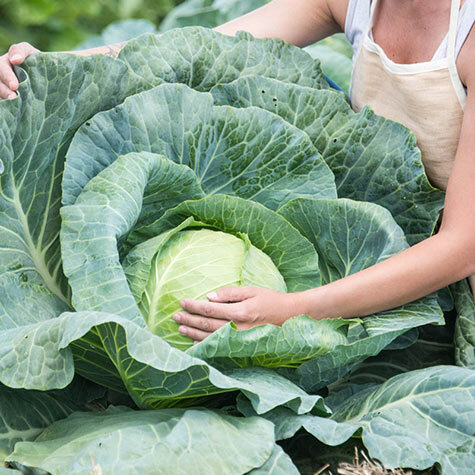 Padoc Hybrid Cabbage was bred for excellent processing qualities and with a good split tolerance—and it yielded the largest heads in our cabbage trials. Cabbage, a cole crop, can be grown in the spring and the fall. For a summer crop, sow seeds indoors and transplant started plants to the garden. For a fall crop, seeds can be direct seeded into the garden in midsummer. Cabbage is hardy and can withstand a frost. 70 DAYS. Spacing: Space plants 18-24 inches. Place closer for mini heads. Foliage: Attractive, deep purple-burgundy foliage. Fruit: Small, round, short core, Â¾ - 1 1/4 pounds, deep purple-burgundy color. Soil Requirements: Well-drained, loose soil. Seed Count: Approx. 50 seeds per packet. Comments: Gorgeous, deep purple-burgundy heads are small in size, with a nice texture almost all the way to the heart. Round, short core heads usually weigh Â¾ - 1 1/4 pounds each, and are generally 6 inches across. Plants can be spaced close for mini heads. Not only a nice, tasty cabbage, but also a very attractive plant, with rich purple-burgundy color. Good storage quality.